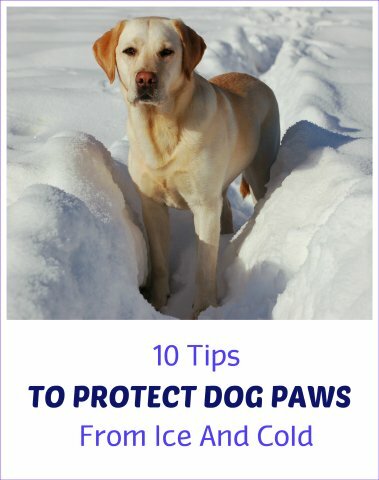 Worried about your dog's paws? Walking your dog and ensuring they get plenty of exercise is an important part of your pet's health regimen. It's easy to meet their daily requirements in the warmer months, but sometimes winter can be a challenge. Not everyone lives in Florida, where canine concerns center around protecting dog paws from heat, not freezing cold. Places that experience extreme weather in the fall and winter months have their own set of challenges. 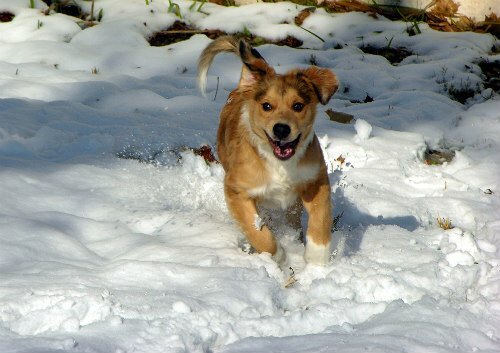 Pet owners with breeds that still want to get out in inclement weather like a postman — come rain, sleet or snow — should take certain precautions to ensure the overall health of their dog's paws. So what can or should you do to keep them safe from the cold? 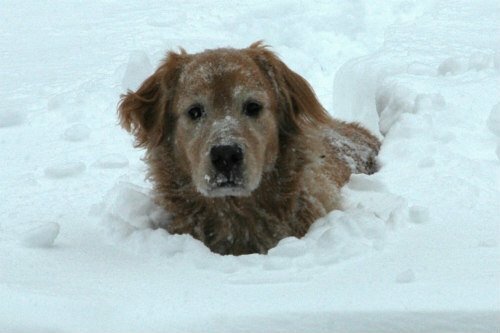 Here's a list of 10 tips to protect your dog in ice and snow from freezing paws. This is probably an obvious tip but one that folks sometimes don't consider often enough. While it's important to take your dog out on daily walks, it's just as important to check their paws regularly to ensure that the pads are crack and abrasion free. Gently but firmly grasp their paw in your hand and visually inspect their pads for any injuries or abnormalities. Next, press down gently on the pads with your thumb and make note of any pain or discomfort this action might register with your pet. Don't forget to check between their toes for any lumps, stickers, cuts or discoloration as well. Just like with humans, the importance of maintaining proper foot health for your pet can't be stressed enough. Toughening your dog's paws is in your pet's best interest. This can easily be accomplished by walking them on cement or pavement regularly. Be aware that rough, uneven surfaces like blacktop (aka asphalt) with courser edges and sharper contact points can lead to sore paws, so start out with even pavement like sidewalks for the first month or so before graduating to the rougher stuff. If you notice your dog limping or a change in their gait after making the transition, inspect their paws for injury and lead them back onto smoother pavement or grass. Over time the gradual build up of thickened skin, much like callouses on human feet, will develop. Some dogs have patches of hair sprouting from between their pads and toes. You can liken it to the thatches that tend to grow out of the ears of elderly gentlemen or the crazy caterpillar eyebrows they sometimes get. While it can be humorous and rather endearing with old men, on dogs it should be trimmed back in winter months to keep snow from sticking and turning into clods of ice which end up clinging to their toes and feet. This is a good way to help avoid frostbite, a serious cold weather malady for both humans and animals. Keeping your dog's feet moisturized can help prevent cuts, cracking or peeling of the paws. This is a common occurrence with humans (think cracked and bleeding heels), and dogs are no strangers to it either. For dogs with toughened paws and those exposed to harsh weather this is especially true. Minor injuries like raw or bleeding skin can leave your dog's paws open to more serious problems. Moisturizing creams and salves can work wonders, but a product like Bag Balm made specifically for pets will work even better. This moisturizer has been around for over 115 years and gets rave reviews from anyone who has tried it. It soothes cuts, scratches, skin irritations and paw abrasions, and the best part is you can get it almost anywhere. If you're not familiar with it, it comes in a green tin and it will last seemingly forever. The cool thing about paw wax is it can quickly and easily be applied to the pads of your dog's paws any place or time it's needed. It protects them from cold and harmful surfaces they're likely to come into contact with when playing outside during the winter. This is different from a moisturizer in that the wax also creates a barrier to help protect your dog's feet from clods of ice forming and potentially harmful chemicals like road salts they might come into contact with. 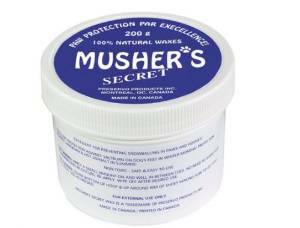 Originally developed for sled dogs, if you and your pet go out frequently in the colder months, Musher's Secret Paw Wax is a really good solution for anytime your dog needs some extra paw protection. 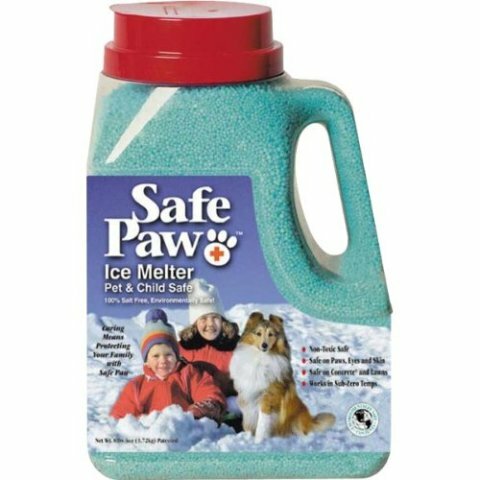 If you're going to use chemicals or salt for slippery porches, steps and sidewalks around your home, consider using Safe Paw Non-Toxic Ice Melter instead. 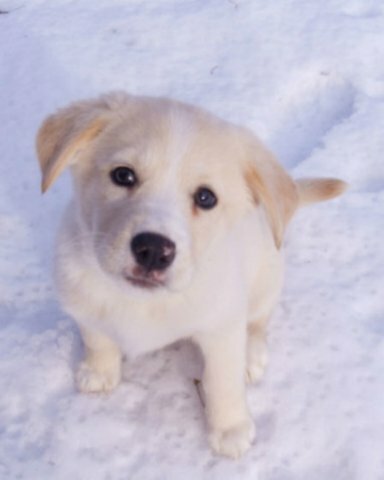 The concentrated pellets cover twice the area of rock salt and will not irritate pet paws or skin. It comes in a time-release formula that helps prevent re-icing for up to three days and it's safe for children, vegetation, and concrete brick and stone. This pet-safe product offers a win-win situation for homeowners with pets. Dog shoes can protect your dog's paws from injuries in relation to heat and cold. The problem is not all dogs will wear them. With a little patience and persistence, though, you might be able to get man's best friend to cave and finally give in. Having a Frenchie that bucked the trend but eventually relented, I'm fully aware it can be done — and there will be some great video and photo ops in the meantime. Once they do get past them, they'll pay them very little mind and be a lot more willing to let you put them on. They're really not that expensive, so it's worth giving them a try, even if they never get used to them. Dog shoes like Ultra Paws Rugged Dog Boots that have rubber soles offer extra protection, but you need to make sure they are a comfortably snug fit, or the weight of the rubber sole could make them flop around when your dog tries to walk in them. Note: Many if not most dog shoes and booties are secured with Velcro around the ankle. During the course of activity these paw protectors will eventually slip and sag, creating a gap between the booty and the paw itself. This can create flopping, which leads to instability and difficulty walking. You'll be inclined to want to tighten the straps, but be conscious of the fact you can tighten them too much and cut off your dog's circulation. This is not something you want at anytime, but especially not during warm and cold weather extremes. 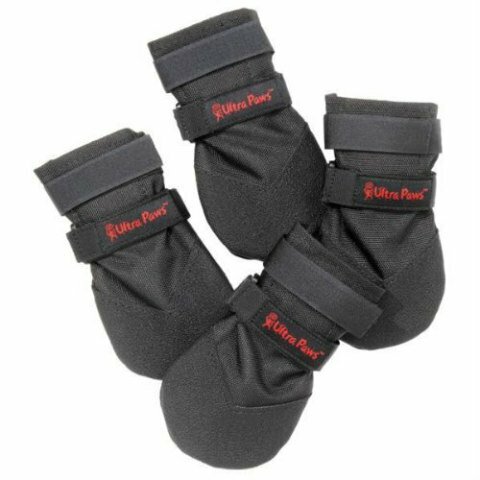 Pet owners looking for moderate protection for their dog's paws should consider thin-rubber dog booties. They're a great fix for summer and winter applications when it comes to keeping your pets safe and comfortable. Besides offering some protection from heat and cold, brands like Protex PawZ Dog Boots can provide superior wetness protection too. They're like small balloons or paw prophylactics that can be reused and conveniently disposed of when they're worn out. The nice thing about this type of dog booty is that (due to their snug fit) they tend to stay up better than other forms of wearable paw protection, and they're also said to give wearers valuable traction. Be aware, though, that in order to avoid injury you should be very careful when trying to pull them up over your pet's dewclaw. The only drawback is that thin-rubber paw protectors like these may not keep feet quite as warm as other types of shoes, boots and socks for dogs. Knit socks are another workable solution for brief exposure to cold winter weather. They're perfect for drafty homes, dashing to and from cars and trucks and running outside to answer the call of nature. Many brands come with skid-proof soles, which will make it easier to walk on ice. Like dog shoes, not every dog will tolerate wearing socks. If you're not sure whether your pet will or not and you don't want to waste the money first, try baby socks (if you have any) and see if they work. Or you can throw caution to the wind and buy these super cute dog socks. As with all animal footwear, you should keep an eye on your pets while they're wearing them, as some dogs will be tempted to lick and chew them off their feet. 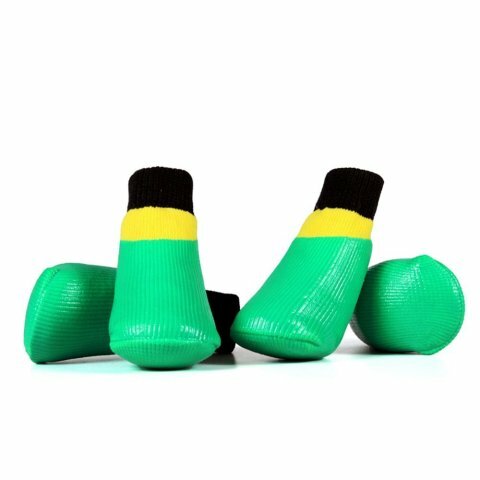 There are also waterproof doggy socks that are thinner than dog shoes that may work well for your pet. Be sure to check your dog's paw pads after each outdoor walking session for signs of damage or injury and wash them whenever chemicals on the ground are suspected. If you do see a problem after exercise or your dog is limping/acting strangely after running around, have him or her seen by your veterinarian at the first possible opportunity. If time is an issue for you, you can save time through multi-tasking by washing and moisturizing their paws at the same time as your visual inspection. 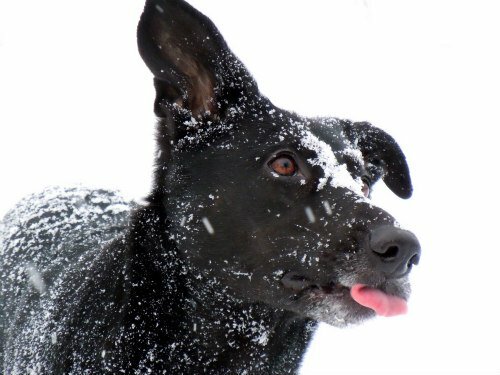 These 10 tips will help your dogs stay relatively safe and uninjured from the dangers of ice, snow, frigid temperatures and freezing cold. 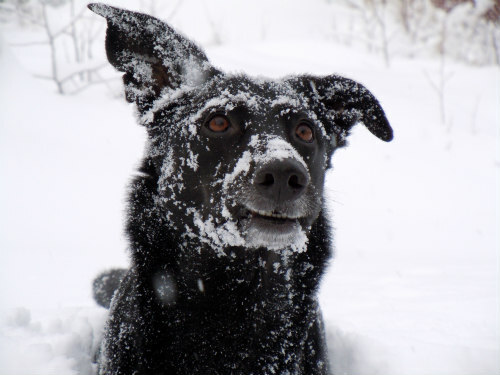 Remember, be sure to keep a close eye on your pet to check for symptoms of a cold and to protect him or her from any other cold-related issues like frostbite or overexposure. 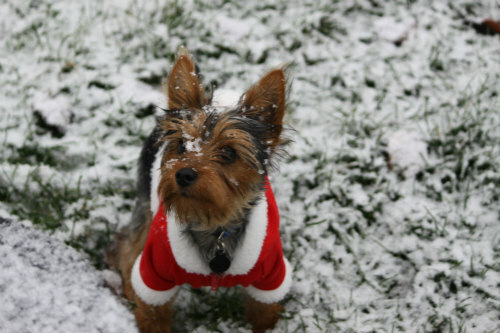 Just like dog summer safety tips, these cold-weather precautions for avoiding freezing paws can help keep your pet happy and healthy all winter long.